A friend I went to college with recently messaged me on Facebook asking for some skincare advice on reasonably priced high street products for oily spot prone skin. She said that she was concerned about ageing and that she wanted to start using a moisturiser to keep her looking young but was worried as she has oily skin that usually breaks out in spots so she doesn’t tend to bother with moisturiser at the moment. I sent her a longer than anticipated Facebook message back, I guess I couldn’t stop myself once I started typing but when I re read what I had written I thought that the information I had given her would be quite beneficial for my blog readers too so I thought I’d share some of my skincare recommendations with you too. She is looking for products that are easily accessible on the highstreet and reasonably priced. First of all, I think it is great that she’s looking to pamper herself more. She’s a gorgeous girl already and works really hard; all girls deserve a pamper every now and again. I really believe that skincare is worth the investment and I’ve tried LOADS of it, particularly for oily skin as that’s my skin type too so I felt that I could really offer her some great products to start her off that were easy to get a hold of (and repurchase!) and within her price range. I also gave her some alternatives too, some that are a little more expensive, and I’ll pop a few extra ones in here for you all. 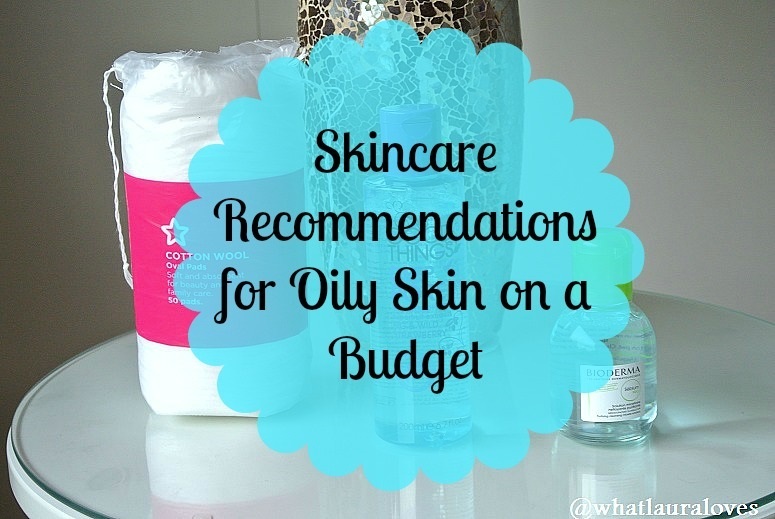 This is by no means an exhaustive list as there are so many great skincare products out there but it is a caption of items I have found that work particularly well on my oily skin and I would personally recommend. I think my first point to make is that skincare isn’t just about applying a moisturiser morning and night, you need a tailored routine to thoroughly benefit your skin. Applying a moisturiser when you haven’t exfoliated or cleansed is just adding a layer onto the top of unclean skin and dead skin cells which will trap any dirt on your skin, then clog your pores and give you dull skin and spots. When developing a skincare routine, you need a cleanser, a toner which is often considered optional but I think it is great, particularly for oily skin (avoid those with a high alcohol content like Clinique’s second step toner like the plague) and a moisturiser. You’ll also need a face scrub to exfoliate your skin 1 to 2 times a week depending on the time of year, how your skin is feeling and how resilient it is. This will keep the dead skin cells away making your skin look bright and will unblock your pores which will stop them from getting clogged and giving your spots when a moisturiser is applied. A brand I would really really recommend for oily skin is Good Things which you can buy in Boots, Sainsburys and Superdrug although I’d suggest going to Boots as they have the biggest range and also have great offers; they’re on 3 for 2 at the moment which offers great savings on an already reasonably priced brand. I was first introduced to them last year when I was gifted some of their products to review and I’ve repurchased them ever since which I think shows how much I really love their products. This is the first step in your skincare routine. Cleansing will get remove makeup, oil, dirt and dead surface skincells from your face and clean out your pores. Toning will remove excess oil, sebum and any remaining makeup and with tighten the pores on your face. For spot prone, oily skin, a brilliant cleanser is the Good Things Deep Pore Anti Blemish Lotion which I reviewed here and here. It acts as a cleanser and toner and is £4.99 from Boots so having the one product is not only fuss free but it is going to save you some money too (available on the highstreet CHECK, reasonably priced CHECK; I’m getting good at this!). Another great product is the Bioderma Sebium H20 Purifying Micelle Solution (review here, buy here) which is a cleansing water that removes make up and excess oils from the skin. You’ll need to get some cotton pads to use with it, I use the large oval ones that are easy to find on the highstreet, I get these ones from Superdrug which are usually on offer, 2 for £2.49 with 50 in each pack. I much prefer these to the small round ones as I only need to use one to remove my makeup, rather than several of the smaller ones so they last longer, save me money and I simply prefer the way the bigger ones perform, much easier to work with and I don’t miss some areas of my face. I’d recommend using the Good Things Deep Pore Anti Blemish Cleanser once on a morning and then at night I’d do a double cleanse by using one cotton pad to take off all of my makeup and then I’d go back in with the second cotton pad to then deeply clean my skin, right down into my pores. If you’re looking for a mid to high end option for oily skin then the Clarins Cleansing Trousse that I reviewed in my Clarins on a Budget post, is an ok option as for £22 you get a 200ml cleansing milk and a 200ml toning lotion as well as a makeup bag and a gentle refiner exfoliating cream (buy here). They do a kit for combination to oily skin and also a dry to normal skin kit. Whilst the products are good for oily skin, I’d say the Good Things cleanser works more efficiently and provides a much quicker, thorough cleanse. The Clarins cleanser is a creamy milk cleanser so it is good to use first thing on a morning whereas the Good Things one is better at removing make up and it is more refreshing. Now that cleansing and toning has been taken care of, it is time to moisturise. It is worthwhile to note that it is just as important to moisturise oily skin as it is to moisturise dry skin, providing you’re using it alongside a cleanser, toner and exfoliater. Using a moisturiser adds water to your skin, not oil so it is still a must for oily skin. I’d recommend looking for a mattifying one. If you’re looking for a budget moisturiser then the Good Things Miracle Mattifier Moisturiser is a great option for oily skin and is only £7.99 from Boots. It moisturises the skin without leaving a greasy film on the skin and making it look shiny so it is perfect for oily skin. Since it gives a matte effect, it is also a great product to use before you put your makeup on as it provides a great base and helps it to stay in place whereas some moisturises will make oily skin too greasy and your makeup will slide off. If you’re looking for a higher end option, then I can recommend the Clarins Ultra Matte Rebalancing Lotion which is available again from Boots but also on the Clarins website and at Clarins beauty counters for £24. It isn’t as moisturising as the one from Good Things but it does soften and smooth out the skin, providing a great base for makeup and it is really light weight too. An eyecream is an optional extra in many peoples book but if you’re looking to keep your skin looking young then Id really recommend getting one. The skin around your eye is thinner than the rest of your skin so it needs to be moisturised with a cream thats specifically designed for the eyes. As a budget buy, I’d recommend the Banish the Bags eye cream from Dirty Works at Sainsburys which is a steal at £4.99. A mid to high end option would be the Origins GinZing eye cream which is brilliant and I’ve talked about it a lot on my blog over the years and a higher end alternative would be the Estee Lauder Advanced Night Repair Synchronised Eye Recovery Complex. Whenever you’re applying an eyecream, make sure you use your ring finger and dab it on rather than pulling the skin so that you don’t cause more harm than good to your eye area. Your eyes are the window to your sole and it doesn’t matter how young at heart you are, you need to keep them looking young too by using an eye cream. My friend said that she was interested in a face mask and particularly mentioned the ones from Mudd that I reviewed here. However I view these as more of a complimentary item to a skincare routine, rather than an essential and since exfoliating is particularly imperative to a skincare regime for oily skin, why not combine a scrub with a mask, giving you two products in one and saving you money. I’d recommend the Dirty Works 2 in 1 Blemish Buster mask which is available from Sainsburys for £4.99. It is one of the few products that I noticed a difference with after the first use and it works equally as well as a scrub and as a mask. If you are looking for a face mask, particularly if you have some spots to contend with, then Sudocrem works really well. You can use it either all over your face before bedtime or as an on the spot treatment. It has antiseptic properties so it works so well to reduce spots literally over night. However for those of you that have some extra cash to splash then the mask I would recommend for oily skin would be the Clayspray Mattifying Red Clay Masque that I reviewed here. If you find that your skin needs a little extra exfoliation than the 1-2 times per week with a scrub then a gentle way to exfoliate daily would be with a hot cloth cleanser like my favourite one from No7 which is about £9 but if you buy the other things at boots when they have the No7 vouchers on you could get it for £4 as you’d have £5 off it. I tend to stock up then! Basically it is a creamy cleanser than you would use once a day, applying it to moist skin all over the face, then you would run the muslin cloth that comes in the pack under a hot tap, ring it out and lie it over your face for about 30 seconds to open up your pores and then use the cloth to polish the cleanser off your face. It really makes a massive difference to the appearance of your skin. I use it every morning and when I stop to use other products for review I really notice the difference in my skin without this product. Finally, a product which is ridiculously expensive but one to perhaps save up for, ask for for Christmas or to buy in duty free is the Estee Lauder Advanced night repair serum which is ridiculously expensive but I honestly couldn’t be without it and like I said earlier, skincare is an investment. A 100ml duty free bottle lasts me about a year and a half. I apply it at night instead of a moisturiser and it makes my skin amazing. Have a read up on it but the basic concept is that it reduces the appearance of past damage to the skin and helps to protect the skins future. So that’s it for my skincare recommendations for oily skin and the second skincare post in my new skincare series. I do hope that it was helpful for some of you. Do you think I met my brief of reasonably priced and available on the highstreet? Which of my picks do you like the most? What products would you recommend for oily skin? Previous Post Skincare Shake Up- Latest Additions!